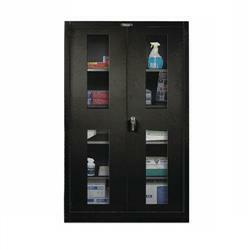 Hallowell cabinets come in a variety of door types, and finishes. Standard features of Hallowell cabinets include no bolt heads show on front or on side panels, positive three point locking (top, center and bottom) and theft resistant hinges for security, chrome-plated locking handle with built-in grooved key cylinder lock, shelves that easily adjust up or down in 2" increments triple flanged shelf front for added strength, doors swing out quietly a full 180° and are 'HAT' section reinforced and come with corner foot gussets that provide added rigidity and stability. At Hallowell, quality isn't a new concept…It has been their way of life since 1903. All of their products are designed & engineered to last a lifetime. No matter what the product is: Hi-Tech steel shelving, 800 series steel storage cabinets,Bulk storage Lockers or Premium Lockers you can rest assured that their products are user-friendly, environmentally friendly, safe and extremely durable. Everything created is meticulously crafted with experience & care as they strive to satisfy all the needs of our clients. Convieniently stocked in up to 6 different locations in the United States for quicker shipping.